THIS PAGE IS ALWAYS UNDER CONSTRUCTION, SO PLEASE VISIT AGAIN. 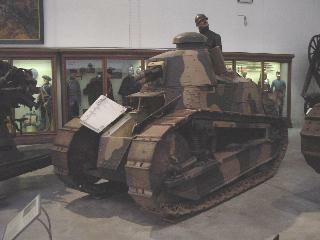 the items shown in the pictures below are all on display in the Belgian Royal Museum of the Army and Military History in Brussels. 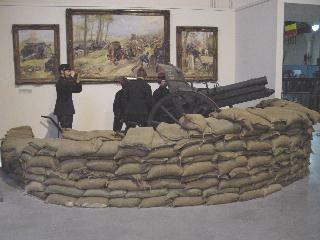 This is only a (small) part of the WWI section of the museum. 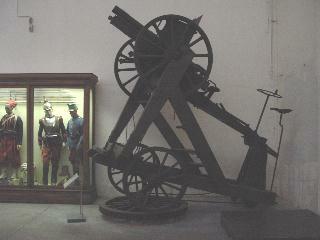 Many more guns, uniforms etc are being displayed. thus assisting fellow-wargamers in painting, modelling and building their miniature armies. range: 6900 m - vertical angle: -5° +43°. 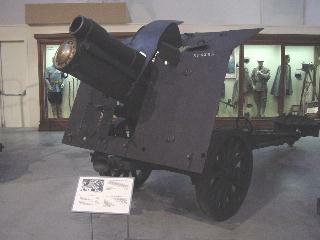 German AA-gun 76.2 mm 1902. 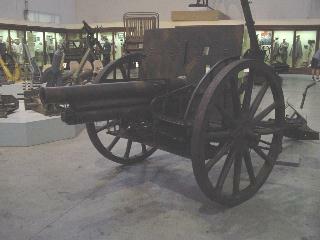 Actually, this is a Russian Putilovsk gun (many were captured by the Germans and used as AA-guns). 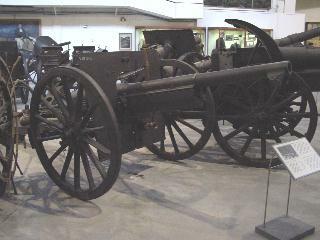 With a weight of 1040 kg (projectile weight 7.4 kg) it had a range of 5600 m.
German AA-gun 77 mm M1896 n/A. 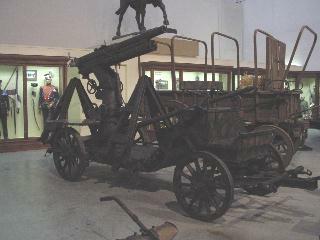 The need for AA-guns resulted in this solution: a German 77 mm Krupp Gun M1896 ("neuer Art") on an improvised wooden AA-carriage. 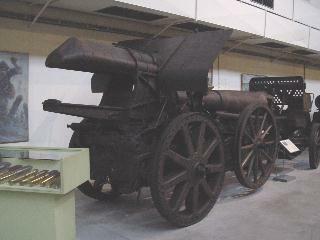 With a weight of 1138 kg (projectile weight 6.2kg) it had a range of 8025 m.
range: 7000 m - vertical angle: -7°30° +18°. 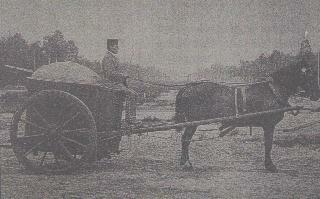 German "Fahrpanzer" with 53 mm gun (1890). 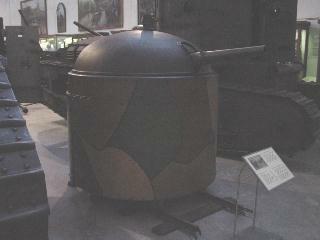 These Gruson-turrets moved over narrow gauge and provided the German forts with mobile artillery. 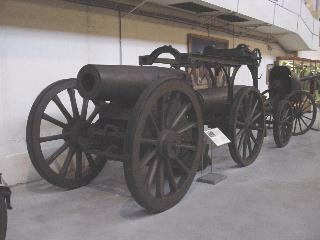 Complement: 2 gunners. 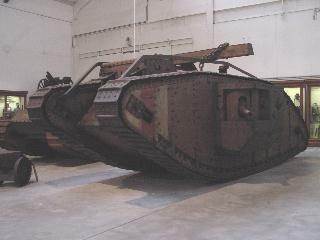 The German "Fahrpanzer" could also be transported by special horse-drawn carts. range: 8200 m - vertical angle: +6° +70°. range: 10200 m - vertical angle: +6° +70°. range: 11000 m - vertical angle: -8° +35°. range: 9900 m - vertical angle: -7° +15°. 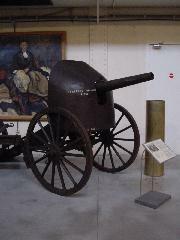 Belgian Cockerill-Nordenfelt 57mm gun model 1888 (1888-1918) - weight: 400 kg - weight of shot: 2.7 kg - range: 2500 m - vertical angle: -17° +13°. 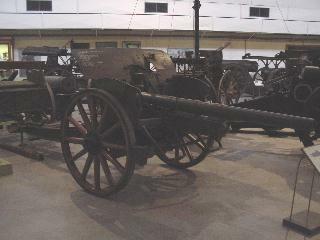 These guns not only supported the infantry of the Antwerp forts, but were also mounted on fishing boats and used by the Germans in their A7-tanks. range: 11000 m - vertical angle: -11° +19°. 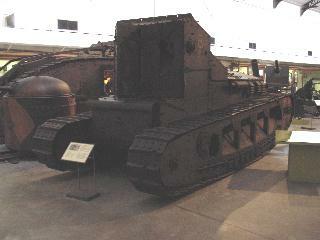 British tank medium, Mark A - "Whippet".